Poc Fada: Bruree GAA’s Puc Fada eventually went ahead on New Year’s Day, having been postponed from St. Stephen’s Day because the course was unplayable. In spite of the short notice, a great crowd turned out with sixteen teams entering the competition. The competion was held over an almost three mile course from Howardstown to the Pump Cross. After some refreshments to keep the cold from the bones, the competition started with Gerard Mullane’s team first off. Over a tricky course with a number of difficult stretches to manoeuvre, tactics were paramount. Skill and accuracy were well tested with a debate as to whether finesse or power was the best approach. At the end of the day there was very little between any of the teams which ranged from Bruree veterans to future stars and also included two lady competitors. Winners, after a shaky start, with a score of 52, were the Welders United team of Brian O’Rourke and Jimmy and Gerard O’Dea. In second place, with a score of 53, was the inappropriately named Going Nowhere team of Mike, Anthony and James C. O’Brien. 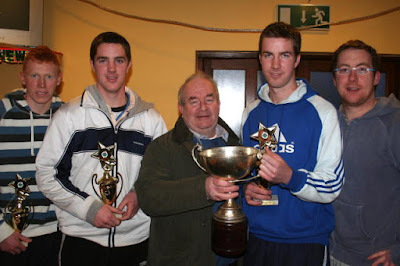 In third place, with 53 shots, was the Ballytigue team of brothers John, David and James V. O’Brien. Trophies were presented at the Central Bar that evening. Thanks to everyone who took part in the competition and to all those involved in organising the day. Particular thanks were offered to Brendan Hogan for his work in organising the event. The proceeds of the day, totalling €500, will go to the Irish Red Cross Flood Relief Fund. Winners in our recent 45 Drives: December 22nd 8 games Brendan O’Kelly and Seamus Sexton 7 games Tom Hanley and Anne Frawley Raffle - Fintan Stone (x2), Anne Frawley, Patsy Healy, Seamus Sexton. December 29th 8 games Brendan O’Kelly and John Sheehan 7 games Josephine Lynch and Noreen Hayes, Ann Potter and Tommy Riordan Raffle - Seamus Sexton, Anne Potter, Anne Frawley, John Moloney (x2). Because of the weather conditions, there have been no 45 Drives in the Community Centre over the past few weeks. Hopefully, the 45 Drive will continue as usual next Tuesday night at 8.30 pm. We would like to thank all those who support the gamble on a regular basis. This support is vital to the future of the gamble and their faithful attendance week in, week out is greatly appreciated. Thanks also to the people who turn up every week to help run the 45 Drive and have done so over countless years. We wish everyone a peaceful, prosperous and lucky New Year. We extend our sympathy to the family, relatives and friends of Michael O’Gorman, Rockhill, who died recently. Granagh Players present The Field by John B. Keane in the Community Centre, Granagh, on Friday, Saturday and Sunday, 22nd , 23rd and 24th January 2010 and on Friday, Saturday and Sunday, 29, 30 and 31 January at 8.00pm each night. A great night’s entertainment is assured from this accomplished group. Lucky dip winners in last week’s Bruree GAA/Rockhill Rovers lotto draw were €50 Aaron Deane €25 Kathryn and Laura Leslie, J. Noonan €20 David Deady, John B., Ballyagran, Patricia Horgan.